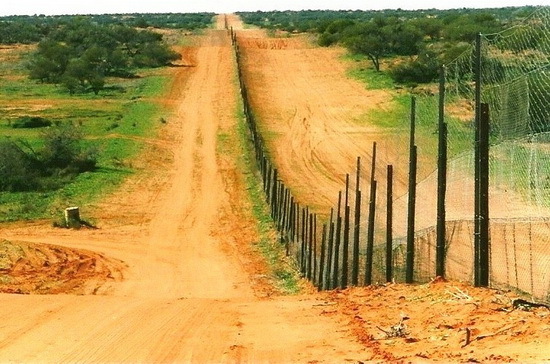 The Dingo Fence or Dog Fence is a pest-exclusion fence that was built in Australia during the 1880s and finished in 1885, to keep dingoes out of the relatively fertile south-east part of the continent (where they had largely been exterminated) and protect the sheep flocks of southern Queensland. It is one of the longest structures in the world and is the world's longest fence (5,614 km or 3,488 mi long). It has been partly successful, though dingoes can still be found in parts of the southern states. Although the fence has helped reduce losses of sheep to predators, this has been countered by holes in fences found in the 1990s to which dingo offspring have passed through and due to increased pasture competition from rabbits and kangaroos. 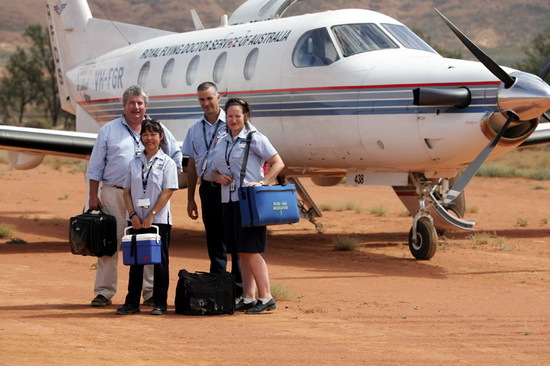 The Royal Flying Doctor Service of Australia (The Flying Doctor) is an emergency and primary health care service for those living in rural, remote and regional areas of Australia. It is a not-for-profit organisation which provides health care to people who are unable to access a hospital or general practice due to the vast distances of the Outback. The Royal Flying Doctor Service is a unique icon of Australian culture. 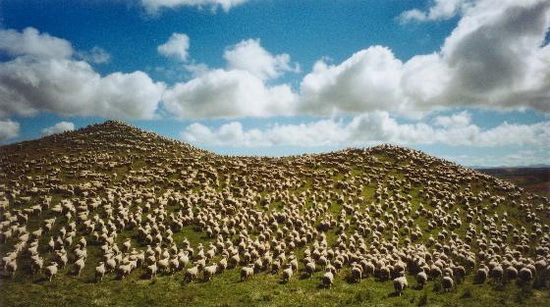 At the turn of the new century (2000), there were estimated to be 120 million sheep in Australia. Due to the effects of ongoing drought and lower demand for wool due to the wool stockpile, this figure has gradually fallen to the point where there is currently an estimated 100 million sheep in Australia. Therefore, Australia has five times more sheep than people (20 million inhabitants). 4. Why Canberra is the Capital of Australia? 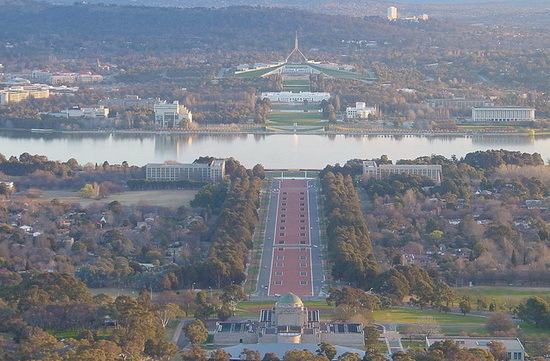 The site of Canberra was selected for the location of the nation's capital in 1908 as a compromise between rivals Sydney and Melbourne, Australia's two largest cities. A location was chosen which was 248km (154mi) from Sydney and 483km (300mi) from Melbourne. It is unusual among Australian cities, being an entirely planned city. The Anna Creek cattle station in the South Australian Outback is by far the largest working cattle station (ranch) in the world. It covers a huge area of some 34.000 sq km (13,000 sq mi). This makes the station bigger than the country of Belgium. By comparison, the largest ranch in the USA is around 6,000 square kilometres. 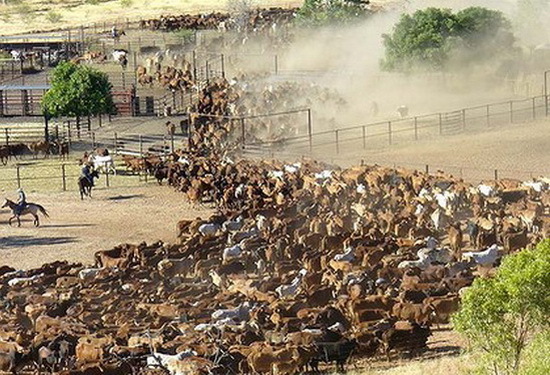 The ranch has a carrying capacity of 16,000 head of cattle but due to the extended drought in Australia this has currently been reduced to less than 2,000 head. Every winter the Australian Alps have more snow cover than Switzerland. The Alps (or "Snowy Mountains") are part of the Great Dividing Range on the eastern side of the country. The Great Dividing Range stretches over 3.500 kilometers (2,200 mi) and runs from north to south through the states of Queensland, New South Wales and Victoria. 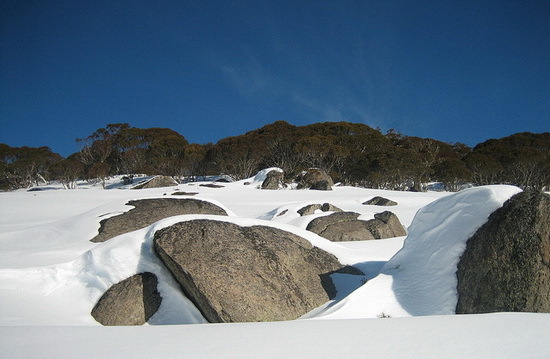 The snowfields are an important feature for Australian tourism. When it's summer in the northen hemisphere, it's winter in Australia. The snowfields are an important part of the local tourism industry. Thousands of visitors from the Northen Hemisphere come to enjoy the skiing and other winter activites on the Aussie snowfields. 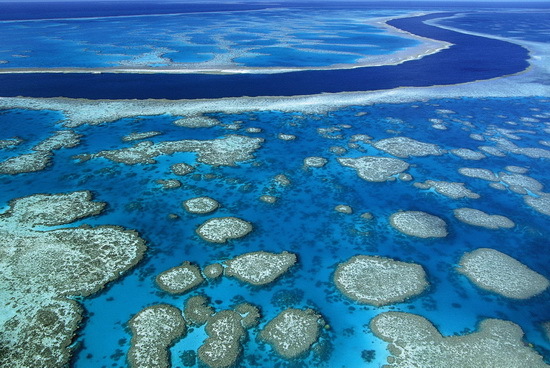 Great Barrier Reef is the largest coral reef in the world, also, it is the largest organic construction on Earth. It stretches for 1,250 mi (2,000 km) in the Coral Sea, off the coast of Queensland, Australia. The Great Barrier Reef is actually a series of individual reefs separated from the mainland by a shallow lagoon. The reef is extremely beautiful and attracts thousand of tourists a year, which threatens to harm the delicate eco-system of the reef and its unusual marine life. The Sydney Opera House is a modern expressionist design, with a series of large precast concrete "shells", each composed of sections of a sphere of 75.2 metres (246 ft 8.6 in) radius, forming the roofs of the structure, set on a monumental podium. The building covers 1.8 hectares (4.4 acres) of land and is 183 m (600 ft) long and 120 m (394 ft) wide at its widest point. It is supported on 588 concrete piers sunk as much as 25 m (82 ft) below sea level. 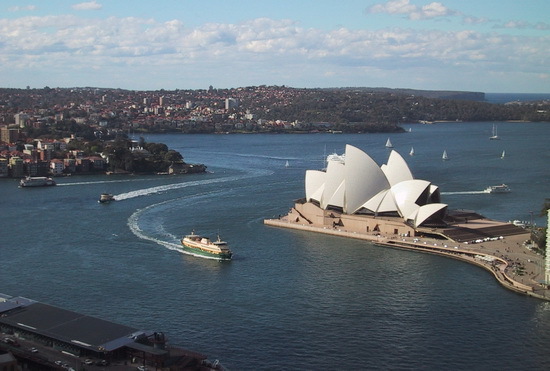 Sydney’s Opera House was designed in 1957 by Jorn Utzon, a Danish architect. Its roof weighs more than 161,000 tons. Britain discovered Australia and as a result used it as a place of imprisonment for thousands of convicts and political prisoners. About 160,000 of Britain's unwanted were shipped out there. Many died on the high seas during the eight month journey. 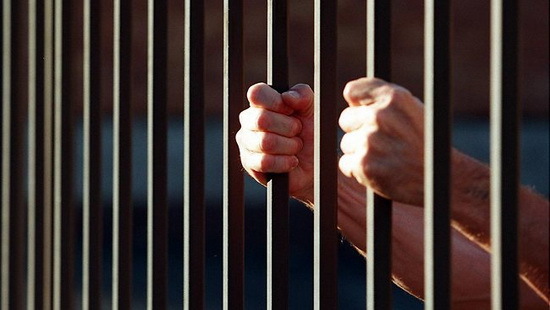 Now, about twenty five percent of Australians have ancestors who were convicts. The Australian Antarctic Territory (AAT) is a part of Antarctica. It was claimed by the United Kingdom and placed under the authority of the Commonwealth of Australia in 1933. 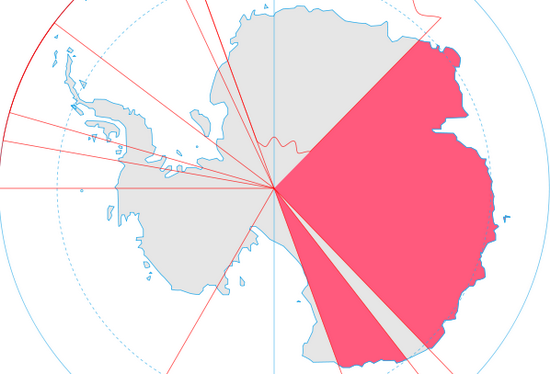 It is the largest territory of Antarctica claimed by any nation. The Australian Antarctic Territory covering an area of almost 5,9 million sq km (2.3 sq mi) is the largest of these territories.